Ryan Pressly dealt six quality innings, the Red Sox scored three early runs, and Carolina managed just three hits in Salem’s 3-2 victory on Saturday night at LewisGale Field. After struggling to a 10.90 ERA over his first four outings, Pressly permitted just three singles and one walk over six frames before handing the baton to the bullpen. Marco Duarte and Mike Olmsted no-hit the Mudcats over the final three innings to preserve the win, Salem’s first one-run triumph of the season. Pressly pitched around two singles in the first inning, and the Sox offense countered with an early tally off Carolina starter Mike Rayl. Sean Coyle’s one out single preceded Brandon Jacobs’ hit-by-pitch. With two outs, Xander Bogaerts singled to center, scoring Coyle and lifting the Sox to a 1-0 lead. In the last of the second, three straight Salem Sox reached to begin the frame, culminating in Jackie Bradley, Jr.’s two-run double. Michael Almanzar and Felix Sanchez both singled to start the inning and raced home on Bradley’s two-bagger into the left field corner. Although Bradley advanced to third on the throw home and stood just 90 feet away with nobody out, he was stranded there. Bradley reached base once more via a hit-by-pitch, but Salem’s center fielder did not score a run on Saturday, snapping Bradley’s streak of nine consecutive games with a run scored. Up 3-0 after two innings, Pressly held the Mudcats scoreless through the fifth. A leadoff walk to Delvi Cid started the sixth ominously, and Tyler Holt singled to move Cid to second. Following Ronny Rodriguez’ sacrifice bunt, Giovanny Urshela’s ground-out scored Cid to make it 3-1. A few pitches later, a wild pitch brought home Holt to inch the Mudcats within one. But Pressly picked up his sixth strikeout by getting Jesus Aguilar to swing and miss, and Carolina would not have another baserunner past first for the rest of the night. 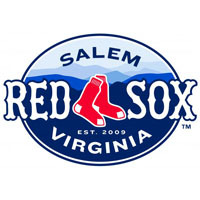 Felix Sanchez had two of Salem’s seven-hits, as the Red Sox streak of ten straight games with at least nine hits came to an end. Alas, the fourth straight superb performance from the Sox starting pitcher helped Salem clinch the series with Carolina. Winners of four in a row, Salem seeks a series sweep on Sunday, with Keith Couch scheduled to start for the Sox opposite Michael Goodnight for the Cats. First pitch from LewisGale Field is set for 4:05.